The BSGG is a single basket adjustable from either side. One end of the leg is pinned to the master link with a non-load bearing retaining pin while the other end can be removed from the master link, passed under or around the load, and then secured back onto the master link at the engineered flat to create the basket. 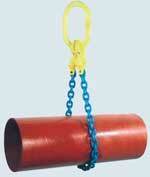 This allows the rigger to capture the load before creating the basket.